After an early morning start and a few blurry eyes on Sunday morning the players flew out with Nuno, Jason and Vera to Lisbon for the first of EFA’s International Football Camps, which in reality is more of an internship as the players are exposed to Sporting’s coaches and facilities on a level that is only experienced if you are in the actual Sporting Academy. Arriving in the afternoon gave us a chance to walk around Lisbon city a little before grabbing some of the famous Pasteis de Belem, and jumping on the bus to the Sporting Academy complex. Some excited kids jumped off the bus as they got the first chance to see a fully professional academy from the inside. After grabbing dinner and sorting rooms, lights were out for our first day of training. Early morning breakfast, with the pouring rain outside had a few players faces worried, but after Head Coach Nuno, organised the undercover training pitches, that soon disappeared, and the few who weren’t smiling soon perked up. The morning session gave the Sporting coach a chance to look over the players and make some assessment on the talent we had, so he could adjust the program for each group of players. The team put in a good display with a few standouts getting mentions back to Head coach Nuno, before the Lunch break. A hungry bunch of players sat down for lunch cleaning up their plates and taking a well-earned break before their next session. Lucky for us the lunch time period allowed the breaking clouds to let through the Portugal sun we’d hoped for, and the team were able to train outside on the full-size pitches for the afternoon session. Our Sporting Lisbon Coach (also named Nuno) pushed the team a little harder with a few challenging and decision making drills to test the guys out and see what they could do before shifting the session in to some key skill development work that was valuable for every player on the field. 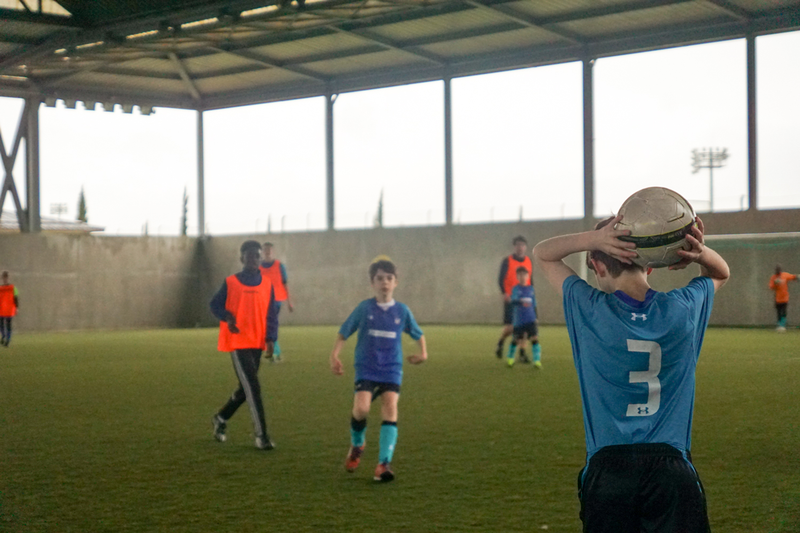 EFA Head Coach Nuno took a few of our selected young players along to an official Sporting Academy training session where they got the chance to train alongside Sporting’s Academy players, and by all accounts did very well.